CRUISE MARkETS conference, The Agency Group cited that their businesses grew AMA Waterways, Viking River Cruises Avalon and also the in the luxury cruise sector the most of any other travel sector, at newest entrant; Crystal Cruises. 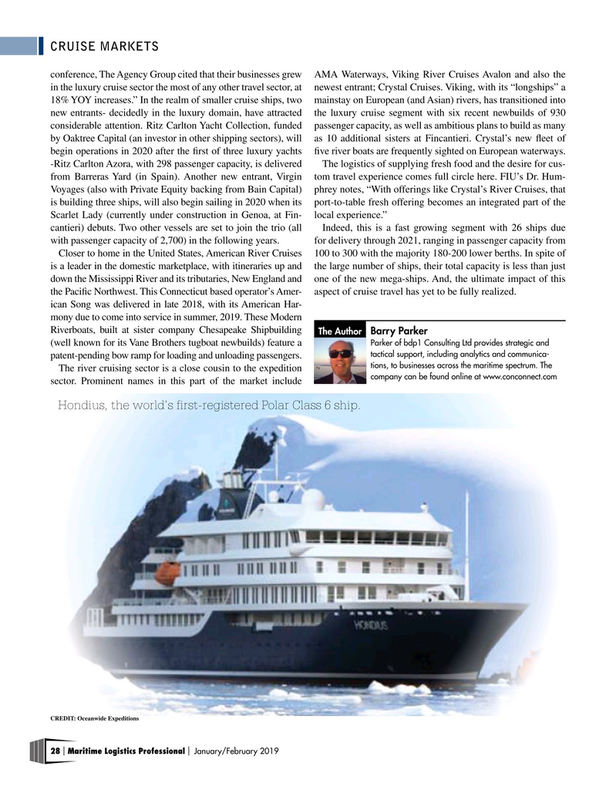 Viking, with its “longships” a 18% YOY increases.” In the realm of smaller cruise ships, two mainstay on European (and Asian) rivers, has transitioned into new entrants- decidedly in the luxury domain, have attracted the luxury cruise segment with six recent newbuilds of 930 considerable attention. Ritz Carlton Yacht Collection, funded passenger capacity, as well as ambitious plans to build as many by Oaktree Capital (an investor in other shipping sectors), will as 10 additional sisters at Fincantieri. Crystal’s new feet of begin operations in 2020 after the frst of three luxury yachts fve river boats are frequently sighted on European waterways. Closer to home in the United States, American River Cruises 100 to 300 with the majority 180-200 lower berths. In spite of is a leader in the domestic marketplace, with itineraries up and the large number of ships, their total capacity is less than just down the Mississippi River and its tributaries, New England and one of the new mega-ships. And, the ultimate impact of this the Pacifc Northwest. This Connecticut based operator’s Amer- aspect of cruise travel has yet to be fully realized. Hondius, the world’s first-registered Polar Class 6 ship.